ACT’s line of Cable Tie Tension Tools offers a selection of cable tie guns that work well in areas or applications of limited or confined space. Each model is especially useful for various application types. 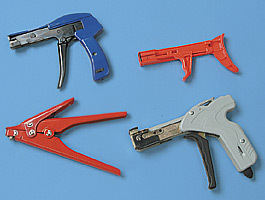 All cable tie gun models can quickly tension and cut off excess zip tie straps without leaving sharp protrusions that can cause snags, cuts, or abrasions to cables, hoses, products, or users. Designed for any user, the AL-100 model is the most cost-effective choice. Light weight, durable, and compact enough to fit into tight spaces, this cable tie gun can quickly tension and cut excess straps by manually twisting the tool, making this the ideal choice for occasional users and home owners working with zip ties of 18 lb., 40 lb., or 50 lb. ACT’s Tension Cable Tie Tool ACTPAC, made of Natural Nylon or UV Black Nylon, works especially well with this model’s twist cut-off tension function. To save installation time, the AL-200 model can help automate and expedite the process. Once you select your choice of tension setting and pull the trigger, the cable tie gun systematically detects the selected tension and automatically cuts excess straps once this tension is achieved. Not only does this function save time when working with a large number of 18 lb., 40 lb., or 50 lb. cable ties, but it also ensures a professional consistency and appearance in quality of work. For work with larger 120 lb. Heavy Duty or 175 lb. Extra Heavy Duty Zip Ties, the AL-300 model is a durable option that manually cuts excess straps by squeezing the handle.